God - revealed to salvation! GOD – REVEALED TO SALVATION! 1 Now Moses was pasturing the flock of Jethro his father-in-law, the priest of Midian; and he led the flock to the west side of the wilderness and came to Horeb, the mountain of God. 2 The angel of the LORD appeared to him in a blazing fire from the midst of a bush; and he looked, and behold, the bush was burning with fire, yet the bush was not consumed. 3 So Moses said, "I must turn aside now and see this marvelous sight, why the bush is not burned up." 4 When the LORD saw that he turned aside to look, God called to him from the midst of the bush and said, "Moses, Moses!" And he said, "Here I am." 5 Then He said, "Do not come near here; remove your sandals from your feet, for the place on which you are standing is holy ground." 6 He said also, "I am the God of your father, the God of Abraham, the God of Isaac, and the God of Jacob "Then Moses hid his face, for he was afraid to look at God. At first it was only a marvelous sight for Moses, - a strange phenomenon would we have called it, - pure and simple it made him interested and curious, just so that he wanted to turn aside to look. (v.3). That’s how it is for many Christians too, even so for those who wear out church- and chapel pews; - Christianity, the Christian life, the Lord and God’s kingdom has still not become more than just interesting. So they read or attends interesting teachings from interesting subjects: - it is so interesting this and that! – the marvelous! “Moses said: I must turn aside now and see this marvelous sight.” (v.3a). As far as this it was only interesting also for Moses, - till “God called to him from the midst of the bush” (v.4), and it dawned on him who revealed himself in this phenomenon, and who he now was dealing with. He wouldn’t have become more frightened if a poisoned snake was revealed in there. “Then Moses hid his face, for he was afraid to look at God.” (v.6b). As long as he could walk there and do things for himself in the desert, busy with tending his father-in-laws sheep, he could manage to live livable with his sin and failure, - a lot of annoying thoughts and memories now and then, but one manages to cope in life nevertheless. We are familiar with the condition. But then suddenly he stood there face to face with the Holy One! – then Moses’ sin and failure, something that slumbered more or less in there in the darkness of the soul, - something he could moderate and have a certain control over, but now it stood there bright and clear as the day: I struck a man to death and buried him down – “hid him in the sand,” it says (Ex. 2:12). First he looked this way and that, - and when he saw there was no one around, - he struck him down. It was premeditated, with knowledge and will, - and after he tried to hide it. His deed for God and his people ended like that! – and now he stood before the Holy One! “Then Moses hid his face, for he was afraid to look at God.” (v.6b). You see today how people is busy with so called godly manifestations, - they run in flocks to see marvelous things, - but when did you see the fear as we see in Moses here? For our God is a consuming fire - towards all sin! (Heb. 12:29). But it wasn’t like this that He revealed Himself here. It was the three times Holy One, All mighty God, who revealed Himself in the man Jesus Christ, - but still not as a consuming fire, - more like a warming fire. But there was no doubt that Jesus was Holy, and the one who will deal with Him, is never in doubt that he is dealing with the Holy One! – No one who came into communion with Jesus could keep sinning, and those who came to Him with their own deeds and pious lives, they were also in touch with the consuming fire, - they were burned by Him. While “all the tax collectors and the sinners were coming near Him to listen to Him,” it says, - yes, even so: All tax collectors and sinners (Luk.15:1). This – god revelation we also meet in our passage: - no doubt about that the fire it is spoken about here was holy – it was the Lord that revealed Himself! – But still the thorn bush doesn’t burn up. It is a way for God to reveal Himself, - not less holy, - but still in a way that He doesn’t become the destruction for the created. It is a picture of God revealed in flesh, as the man Jesus Christ. But it was holiness for Moses, as we can see first of all of God’s word to him: “Do not come near here; remove your sandals from your feet, for the place on which you are standing is holy ground." (v.5). Shoes are a picture of mans wandering, and it cannot stand before God! It was these “shoes,” that Jesus never got the Pharisees and the scribes to take off. But it is far better with you right? You are standing without “shoes” before the Lord right? As it says in a known song: “Naked, come to thee for dress; Helpless, look to thee for grace.” (Rock of Ages). Have you seen Jesus like that? – God revealed to salvation. God said nothing to Moses about this Egyptian that he had struck down, - He didn’t need to, - Moses was probably quick to get off his shoes where he was standing! The law in his mind, had probably already made Moses bend down in the dust, in feelings of guilt and anger, - and the Lord doesn’t add a stone to the burden. As He says to Moses, further on in the passage: “So I have come down to deliver them from the power of the Egyptians, and to bring them up from that land to a good and spacious land, to a land flowing with milk and honey.” (v.8a). Notice what it really says here. It wasn’t Moses who would lead them out, - no, listen to what it says here: “So I have come down to deliver them from the power of the Egyptians, and to bring them up from that land to a good and spacious land, to a land flowing with milk and honey.” (V.8a). I! – Says the Lord. Moses is just the one who should go and preach it. Moses is the one, by whom He lead them out, - but it wasn’t by Moses’ power, it was the Lord who did it! And this isn’t a story, it is history! – It has really happened! And to you too it sounds: “So I have come down to deliver them - ! And to bring them up - !” Yes, up where you could never get to! – “I will bring them up!” says Jesus, - therefore I have come to earth! And listen to this: I! – When it speaks of your salvation; - it’s not called, you, you! – But I, I! I will bring you up! He uses a certain designation, to tell Moses of who He is: “I am the God of your father, the God of Abraham, the God of Isaac, and the God of Jacob.” (v.6a). Jesus uses this in a meeting with the Sadducees – those who denied that there was any resurrection from the dead, - one time; - the Sadducees, that times liberal theologians or ethic thinkers, if you like, - it’s the same sort, - and then He uses it to make something clear to us (also God’s – or God’s people’s opponents He uses to for our benefit); - we will read from three of the gospels: “But regarding the resurrection of the dead, have you not read what was spoken to you by God: I am the God of Abraham, the God of Isaac, and the God of Jacob.? He is not the God of the dead but of the living.” (Matt. 22:31-32). But regarding the fact that the dead rise again, have you not read in the book of Moses, in the passage about the burning bush, how God spoke to him, saying, 'I am the God of Abraham, the God of Isaac, and the God of Jacob?” (Mark 12:26); “But that the dead are raised, even Moses showed, in the passage about the burning bush, where he calls the Lord the God of Abraham, the God of Isaac, and the God of Jacob.” (Luke 20:37). You who have taken your refuge in Jesus, - you have taken your refuge to life, to the source of life! – You shall not die, you shall live! He is the God of the living! – And this life, the eternal, He has given you in His Son, the Word testifies of (1 John 5:11). Isn’t it time to kick off your dirty shoes, and take your refuge in Him whom God has sent instead? – Let me just remind you that the one who doesn’t kick off his shoes, he will meet God, not in the mild warming fire, but the consuming. 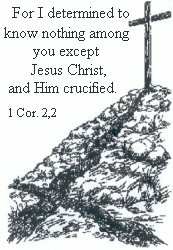 That is exactly the reason that you shall not die, but live, - because He has taken and carried what would make you die, - your sin! Therefore it is a rejection of Jesus Christ work, both on earth and in heaven, to want to keep your own. We have lost our originally image (God’s image) in the fall of sin, and that has to be reestablished by Jesus Christ. You often hear it is said today: We are created in the image of God, and therefore we are also incredibly much worth, - because we carry the image of God. That is “good theology” in all ways today – also in Lutheran context. I want to ask you: Is it biblically right? No, this is a mix between truth and lie, as the devil is a true master in. This is so called New Age thoughts and not biblically theology! It is true that we were created in the image of God, and it sounds like this: “God created man in His own image, in the image of God He created him; male and female He created them.” (Gen. 1:27). But then we know something happened, that is spoken of in Genesis 3, - man fell in sin. And listen to what is said further on: “When Adam had lived one hundred and thirty years, he became the father of a son in his own likeness, according to his image, and named him Seth.” (Gen.5:3). What image was that? – Was it God’s image? – No, it was the fallen image of Adam! Therefore man started carrying sacrifices before God, - and Abel the true sacrifice, the bloody! – And therefore also this God’s call to Moses, as we meet in our passage: “Do not come near here; remove your sandals from your feet, for the place on which you are standing is holy ground.” (v.5). No, God hasn’t come to exalt us, by what we are in ourself, - For the Son of Man has come to seek and to save that which was lost (Matt. 18:11 and Luke 19:10). Then you must look and see if that is where you live, so He doesn’t knock in vain! “I must turn aside now and see this marvelous sight,” (v.3a). Yes, if we only would all see this marvelous sight, - the Holy One, revealed to salvation for the sinners. The Scripture explains it among others like this: “- for the Law made nothing perfect, and on the other hand there is a bringing in of a better hope, through which we draw near to God.” (Heb.7:19). This better hope is God revealed in flesh, Jesus Christ! By that you may also draw near to God!